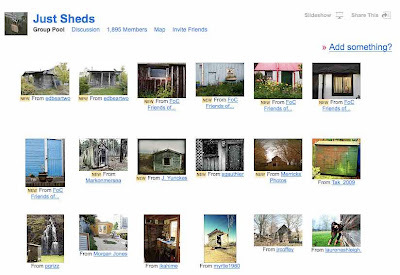 The Just Sheds pool on Flickr continues to grow apace and now stands at nearly 1,900 members and a vast library of garden offices, sheds and shedlike atmospheres. If you want something lovely to look at today, do nip along and have a gander. Alan and I love working in our HQ in the garden because it's handy and means no wasted commuting time, don't have to worry about transport problems, it allows us to integrate family life easily, it's warm and cosy in the winter and airy in the summer, there's a shaded verandah to use in the good weather which is also an ideal place for a glass of wine at the end of the day and in the recent snow, we've been able to get on with business. 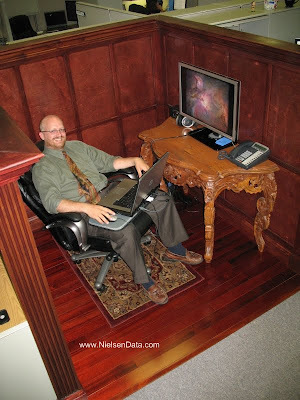 I have a core of great clients and a fabulous team of associates who help me keep them in order. I have a studio office in my garden where I work from, I do the school run and we have dinner at 6pm. And best of all, my net income is similar to what I had as a full-time employee. Over the first few months, her self-esteem improved. The impact had a knock-on positive effect on her sleep patterns. After a full year she has gradually increased her income by using her garden office to write in. 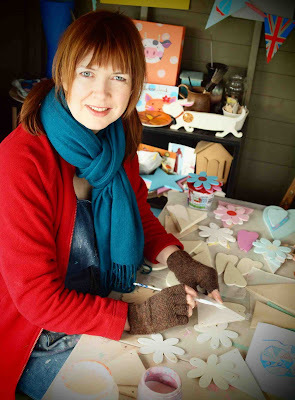 As a freelance author she has enjoyed regular publication in newspapers, magazines and specialist teaching websites. More details at the blog. 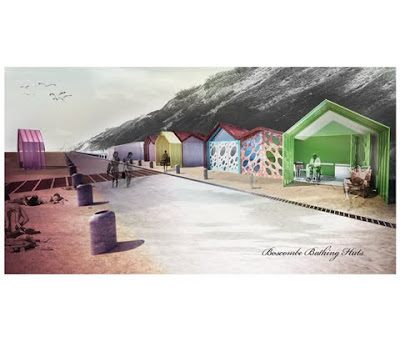 Individual colour-coded beach huts are co-joined under a single unifying structure, designed to echo the sculptural roofline of historical beach hut architecture. Each hut boasts a lightweight collapsible canvas structure, which can be taken onto the beach to provide its occupier with a mobile anchoring point, allowing enjoyment of the beach with the benefit of a shaded private area. I’m going to make an assumption that because you are a shedworker you are probably self-employed and at this time of year the self-employed are doing one of two things: congratulating themselves for getting their tax return in well before the due date or running around panicking over the shoe box full of receipts that sit in front of them. Bet you thought this year you’d be more organised! Well unless you take massive action in this area, nothing will change.Don’t put it off until the weekend ~ do it today! Carve out an hour and just do it. Post off your return or save even more time and do it online and promise yourself that next year things will be different. Well before April 5 set up a system. It only takes minutes a day to put all your receipts in a designated place, give yourself half an hour each week to input your figures into your accounts package and set aside just one hour per month to reconcile and send out invoices. Do this and you will never be taxed by your tax return again. Remember: The more you do, the less you will pay your accountant. Use that as motivation! 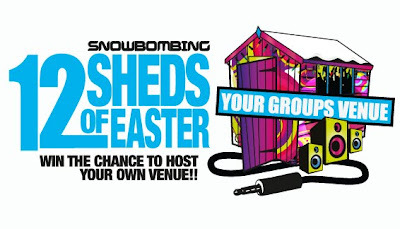 The V&A is preparing early for National Shed Week with two major exhibitions featuring sheds and shedlike atmospheres. 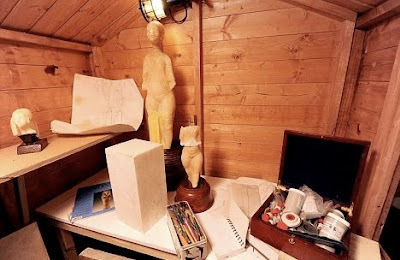 Currently running (until February 7) is the Metropolitan Police’s first 'fakes and forgeries' exhibition which features over 100 fake works of art as well as, points out that other shed blog, a tip top recreation of the garden shed (pictured above) in which Shaun Greenhalgh produced various Lowrys, Hepworths and Roman antiquities made from melted down Roman coins. His B&Q drills and polishers as well as other equipment are also part of the exhibit. 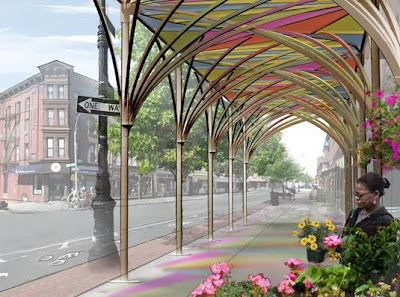 The starting point for these experimental projects will be the idea of a small enclosed space representing an escape from the chaos of urban life to an area for peace, contemplation, shelter or creativity. One of the central aims of the exhibition is to move away from explaining architecture through drawings and models and instead allow the visitor to experience the architecture itself. Open Construction was established in January 2009 by Jason Young who has had more than 20 years in the construction industry. Taking the decision to run their businesses from home, both Jason and his wife Lyndsey (who came up with Count On It, previewed here last week) needed dedicated workspace out of the home to be able to run their businesses professionally and successfully. 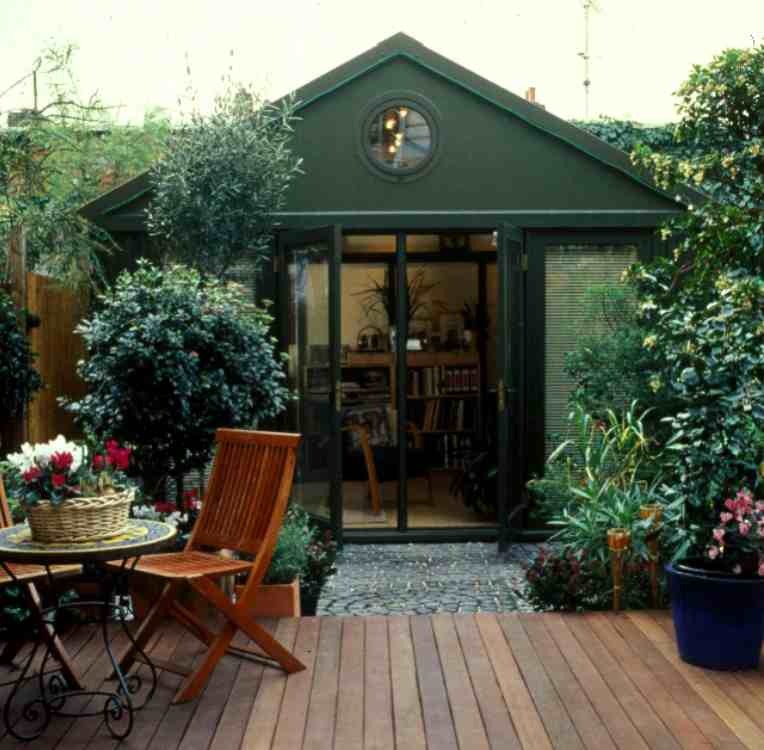 With a reasonably large garden, a garden office seemed to be the perfect solution. 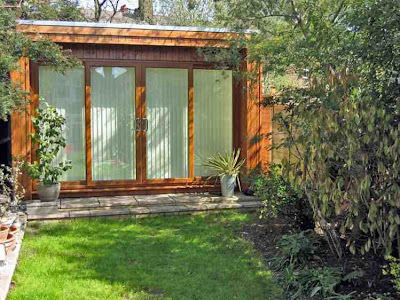 Rather than buy a garden office 'off the peg' they decided to combine their design and construction skills and build themselves their own garden office. Built on insulated concrete foundation slab, the timber framed construction is fully insulated and is finished with 'thermowood' timber cladding. 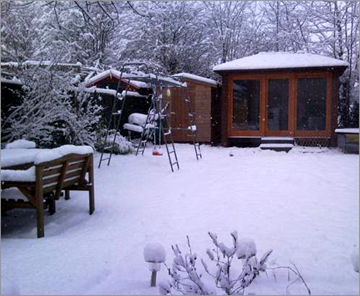 With timber sliding folding doors and large full height windows, all double glazed, the office has lots of natural light, yet is cosy enough to work in, even throughout the recent snowy conditions. The interior of the office comes with plastered walls and ceiling, laminate flooring (which floats on a sub floor of chipboard and insulation) with chrome electrical fittings and downlighters. Since moving into the office they have received so many positive comments about the space and the flexibility of its use, e.g. consultation room, studio, teenagers den or even a garden lounge, Open Construction has now added it to its portfolio of products and services, under the name of 'Open Spaces'. She needed an office, her house wasn't big enough, so she squeezed an attractive little structure into her Queen Anne back garden. The building is only 10 by 12 feet, but it is light and airy due to the high ceiling, multiple windows and wood-trimmed French doors opening to the garden. The efficiently organized office allows for a computer, space to draw, store supplies, even room for a cat to curl up on the windowsill. The floor is concrete, the roof metal and decked out with a rain chain to harvest water for irrigating the garden. Hand hoped to spend about $100 a square foot, but her office retreat ended up costing, with heat and good-quality windows, nearly double that. "It's simplified my life not to commute to work," says Hand. "Everything I need is right here, with enough separation from the house." Spotted by Robin Peach in North Stainley. If you know any more about it, please get in touch. 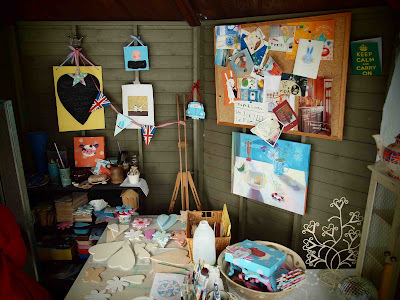 "Working in the shed is fabulous - my own little haven where I can just be and get lost in painting. I love it. Also I rarely take my phone in there so it really is peaceful - just me and Radio 4 - bliss. One day it will be surrounded with a cutting garden. It's really warm when the sun is shining and freezing in winter when it isn't (although in the summer on a cloudy day it's just right). At the moment we run a cable from the garage through a little hole in the window frame to plug in a fan heater. When we built the summerhouse we did concrete in a cable but a rat ate through it and we just haven't got around to seeing if it can be salvaged... two years on!!" Although it feels like a long way off, the fourth National Shed Week is speeding towards us so if you haven't signed your shed up to take part (and of course be in the running to scoop the top prize of Shed of the Year 2010) then please do nip across to readersheds.co.uk and follow the instructions to share your shed. There are already plenty of garden offices vying for the overall prize and the garden office category prize which you can browse here. 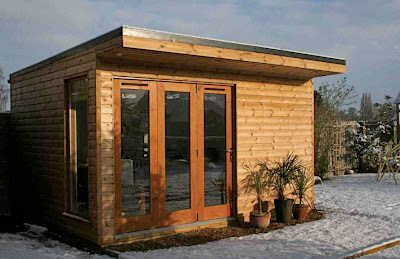 The new blog from garden office supplier Studioni looks very promising indeed. They certainly have ambitious aims, stating that the blog is not a sales pitch but an attempt to "shake our industry into a sense of responsibility for the environment and inform consumers by publishing expert opinions". 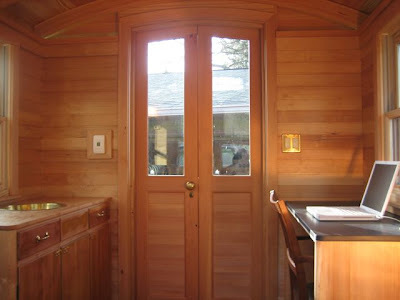 They are particularly keen to include guest posts from people with specialist knowledge of engineering, thermal values, ecology, and the environment and recent posts include intriguing takes on everything from landscaping your garden office nicely into your garden to a thoughtful look at who exactly you should buy your garden office from. Well worth a browse. First, I cooled down my bedroom — a 13-by-13-foot room with 10-foot ceilings and two large windows — to 55 degrees by turning off the radiator and opening a window. Then, I closed the window and the door, placed each heater in a corner near the radiator and, turning the heater up to its highest setting, timed how long it took to heat the room to 65 degrees; most took less than a half-hour. I also tried each heater as I worked at my desk, to see how it fared at warming up a small area. Well worth a browse. Pictured is the Holmes Ultra Quiet Ceramic Heater. 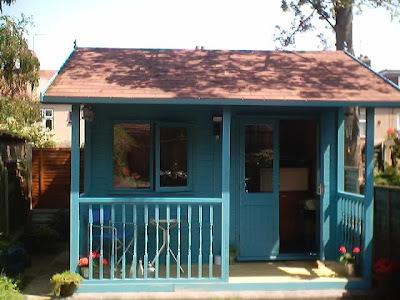 I have a wooden built 16sqm Office to rent in my garden, next to railway lines but quiet and ideal for a creative as the view is of the garden and trees and it is very undisturbed (apart from the trains - best be honest!). It would suit an architect or desinger who wants an inspirational space and I would be happy for you to work in the garden should you want to. Internet and electricity are included in the rental price. Just a quick word to explain a couple of changes in how Shedworking will be listing garden office suppliers from the end of this month. 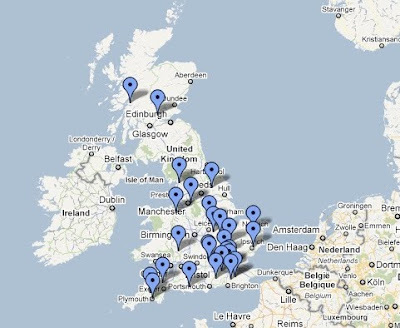 The plan is that all suppliers will be listed on the specially customised Google map we started setting up last year (and which has had approaching 400,000 page views). This will have contact details and a clickthrough option to their individual websites. We're not finished yet, but eventually this will become the only list of it's kind, online and offline with the added bonus of a geographic element which the current system doesn't offer: we hope this suits both readers researching their future garden office/building and the suppliers themselves. This is an entirely free service. What is currently a long and unwieldy list of suppliers will become a smaller section like the Shedworking Classifieds. Suppliers listed here will have paid to appear and are not officially endorsed by Shedworking (although we are very appreciative of their generous support which will help to keep the site running). We hope these two changes will mean the independence of the site is preserved while at the same time ensuring its survival, which is surely good for everybody. 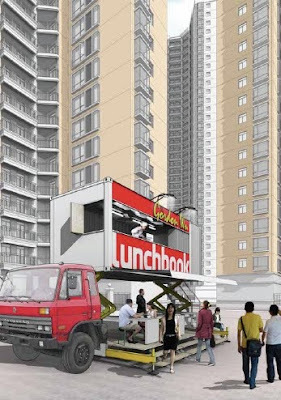 The rollout of a similar approach for non-UK suppliers will follow shortly afterwards. 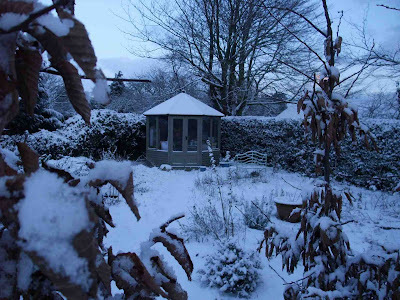 An interesting post at a new blog from Tiger Sheds called Garden Resources on what they describe as the feminisation of the garden shed. Their conclusions is that "it’s clear that a definite shift in the world of the garden shed has taken place. The media has introduced home improvement as an activity for both sexes and that, along with an economic downturn, has encouraged a change in attitude toward that little bit of extra space sitting at the bottom of the garden." There's a particularly interesting link to an ABC article about the Sheila's Shed phenomenon in Australia. This marvellously green interior as showcased on designboom is actually a children's extension to a villa in Stockholm by visiondivision. But wouldn't this kind of sculpted artificial grass (the hillocks are portable) look great in a garden office? 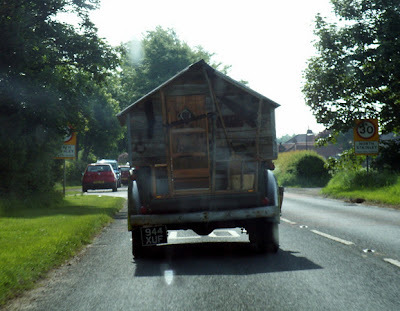 If you're looking for a slightly unusual garden office, don't forget to check reclamation companies' stocks. 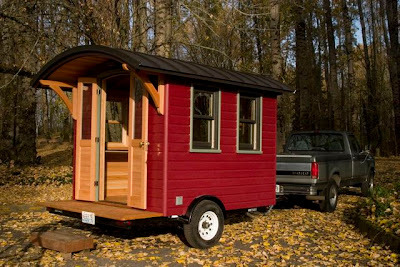 Here for example is a shepherd's hut available at The Beechfield Reclamation Company in Devizes, Wiltshire, which is insulated and mains wired and would make a great shedworking atmosphere. The spherical Pod from York-based Archipod (pronounced 'ark-ee-pod') is an insulated, prefab, curved plywood shedworking space roughly 3m in diameter (and a height of 2.5m from floor to underside of the rooflight) specifically targeted at the garden office market. They are also working on a 'Fatpod' of 4m diameter which could be used as a meeting room space. Features include the pleasing roof dome, double glazed stainless steel porthole window with our old friend Western Red Cedar for external cladding (though they are also looking at reclaimed copper, stainless steel, and recycled car tyres as alternative claddings), and a snazzy semi-circular desk. It'a also fully insulated using fibreglass insulation made from recycled glass. There's a rather nice photomontage option too: send them a photo of where you'd like to put it in your garden and they will add in a 'Pod' and send it back to you.